Roy Thomas later called "Uncle Sam's underwear". With flag-draped figures like The Shield, Captain Freedom and even Uncle Sam himself having paved the way, Captain America was the first successful character published by the company that would become Marvel Comics to debut in his own comic. 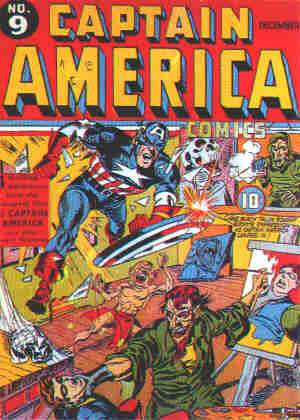 Captain America Comics #1 was dated March, 1941. The creative hands behind this longest-lasting member of the red, white and blue brigade were Joe Simon and Jack Kirby. Don't ask which was the writer and which the artist — as Kirby explained their collaborations years later, "We both did everything." Through all of the 1940s and most of the '50s, the Simon & Kirby team was a prolific source of comic-book character creation, enriching the stables of most of the top comics publishers. However, their work on Cap ended after ten issues. The opening story told how Private Steve Rogers, a typical wimpy alter-ego, participated in a scientific experiment to become the first and (because of enemy sabotage) only person to benefit from the so-called Super Soldier Serum. He adopted the Captain America persona as a way of eschewing personal glory. Later in the same issue, a boy named Bucky Barnes accidentally learned his secret, and thus became Cap's sidekick. It was also in this issue that Cap and Bucky first met their arch-enemy, The Red Skull, a former hotel bellhop whom Hitler personally promoted to the post of super villain. Captain America and Bucky fought Nazis for the remainder of World War II, and other forms of evil thereafter. In the 66th issue (1946), Bucky suffered a bullet wound, and was replaced by a new partner named Golden Girl. Also in that year, Cap and Bucky were members, along with The Human Torch (and the Torch's sidekick, Toro), Sub-Mariner, The Whizzer (a knock-off of DC's Flash) and Miss America, of the short-lived All Winners Squad. In 1949, when most of comics' superheroes had already dropped out of sight, Cap and both of his partners faded into obscurity with them. He enjoyed a brief revival in 1953, when he and a de-wounded Bucky were pitted against the Commie menace. Needless to say, The Red Skull had by then switched his allegiance to something a little more color-coordinated. This time, however, Cap failed to find an audience. He was gone again a year later. The character got his true second wind in 1964, when a group of more up-to-date superheroes, The Avengers, found him in suspended animation, frozen in a block of Arctic ice since 1945. Bucky was dead, and Golden Girl not mentioned. All post-war adventures were explained (years later) as having been experienced by someone else. Cap became a member of that group, and has remained associated with it ever since. Within a few months, he was back in solo action, sharing the title Tales of Suspense with his Avengers compatriot, Iron Man. Co-creator Jack Kirby returned to draw him in that venue, and remained on the character until 1969. In 1968, Iron Man moved out into a title of his own, and Suspense was re-titled Captain America. Since then, he has been continuously in publication, and is now one of Marvel's most reliably-selling characters. He's taken on an occasional new partner, such as Rick Jones (formerly hooked up with The Hulk and later with Captain Marvel) or The Falcon, (no relation) but has mostly adventured by himself. Kirby returned for another stint from 1976-77. In more recent years, Cap's adventures have been written and drawn by such top creators as Mark Waid and John Byrne. He has not fared so well in other media. A 1944 movie serial (reissued in 1953 as The Return of Captain America) was so different from the comic-book version, they might as well have been two different characters. A 1966 series of made-for-TV animated cartoons had such limited animation and so little in the way of originality, that they are of interest today mostly as curiosities. His 1979 made-for-TV movie is virtually forgotten. In 1992 a feature film was produced but never released theatrically; it made its debut on videotape. He has appeared in a couple of paperback novels, but none that stayed in print very long. But animated versions of similar Marvel characters, such as Spider-Man and The X-Men, have been well received in recent years, so who knows? Cap may yet break out into the wider world. But in comic books, The Red Skull finally succeeded in killing Cap in 2007. To ensure Marvel is never without its most iconic character, he was traded out for a de-killed Bucky. So far, he remains dead, but since even Bucky and the Skull ultimately didn't, that means less than ever in Marvel comics. Text ©1999-2010 Donald D. Markstein. Art © Marvel Comics.